Haute Couture designers are clearly not oblivious to the state of the world’s economic affairs but each channeled their feelings into jaw-dropping collections of one form or another. At Valentino it was a prairie romance as a flurry of dresses in delicate floral prints with high necks and lace bibs floated down the runway on the backs of very prim models. Granny’s curtains go couture! At Chanel, Karl Lagerfeld took us on holiday in a specially created airplane shell built inside the Grand Palais. 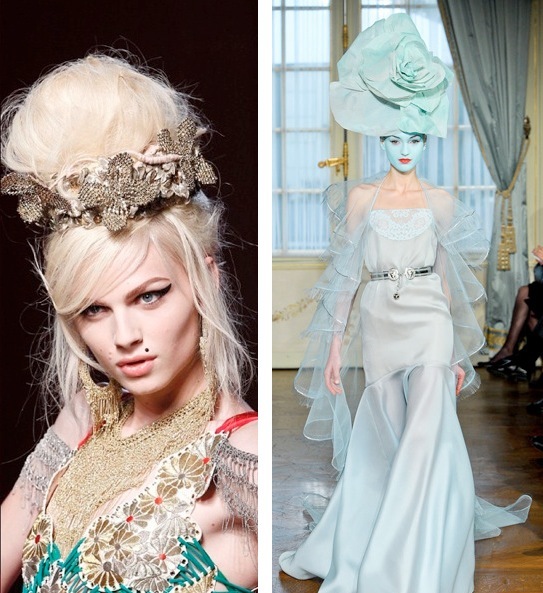 The Paris couture fashion week 2012 collection featured clean, modernist lines and in keeping with Mr Lagerfeld’s blue-sky thinking all ensembles were based on a blue palette. At Givenchy, Riccardo Tisci interpreted the current state of forced penny pinching and financial restraint with a dark, fetish collection. Whilst Versace and Jean Paul Gaultier looked to the future with sci-fi corsetry designed to elongate the model’s already gazelle like frames. 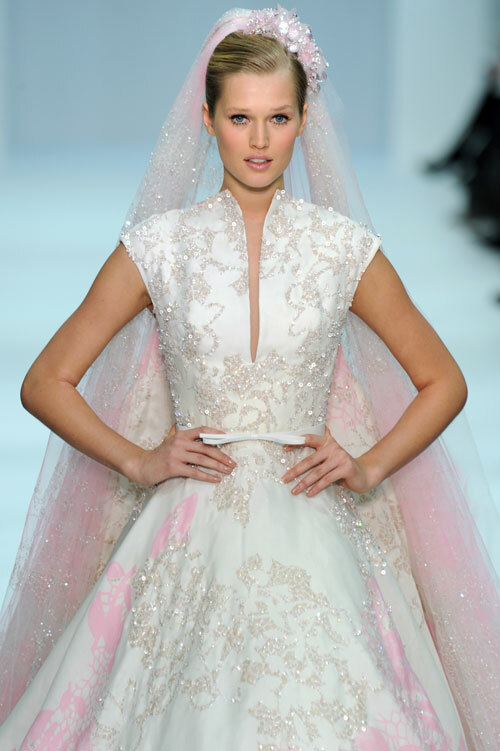 The Haute Couture wedding gowns seen in Paris last week were all about the embellishment from heavily encrusted sleeves and panelling at Chanel to 1950’s meets Marie Antoinette at Christian Dior. Prepare to be dazzled. 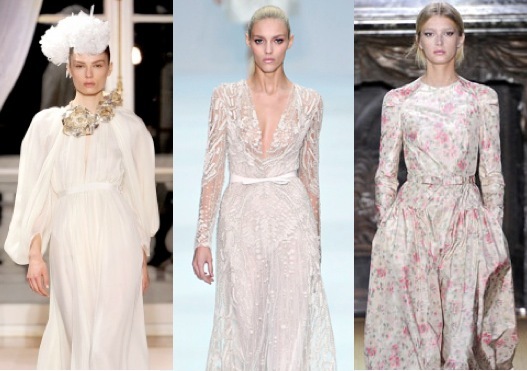 There were a few of micro trends I spotted from Paris couture fashion week 2012 that will be sure to infiltrate the wedding world this year. Firstly high cut waistline’s with ribbon belts and secondly exaggerated headwear plus for hair it is all slicked back and simple. Whether you were sat at Giambattista Valli (left), Elie Saab (centre) or Valentino (right) all the models were sporting delicate bow belts. At Jean Paul Gaultier it was the Amy Winehouse inspired bee hive that provided height and over at Alexis Mabille it was gigantic pastel hue flowers. 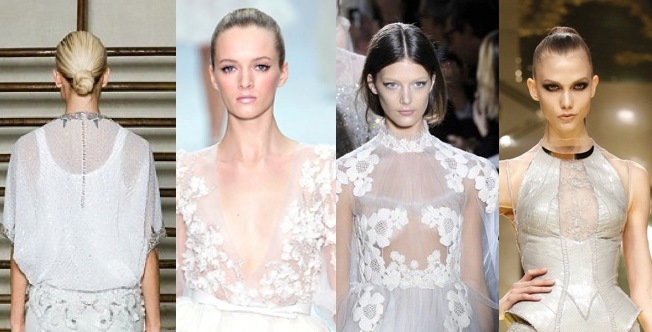 Hair was generally slicked back into simple ponytails and buns as seen as Givenchy (far left), Elie Saab (second from left) and Versace (far right) whilst slightly looser but still straight at Valentino (second from right).